The Pharmacy and Medicines Management Centre at Antrim Area Hospital was the venue (on 21st January) for a conference on improving the health service via new technology development and adoption. There were 33 attendees from healthcare companies, government procurement, clinical and academia who participated at the event designed to help small and medium enterprises (SME) understand better how to work with and access the NHS market. 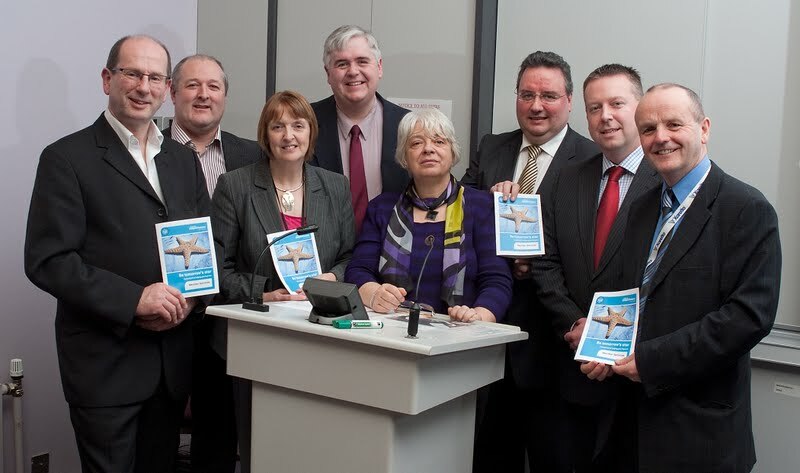 The programme was put together by the Centre for Competitiveness and BioBusiness in conjunction with HSC Innovations. The purpose was to give SMEs, an insight into sourcing and selling new technology products into the NHS/HSC, and also how to work with the NHS/HSC to collaborate in developing new products/technologies for specific clinical settings. Professor Mike Scott, Head of Pharmacy and Medicines, then gave an overview of how the pharmacy department in Northern Health and Social Care Trust had developed products and linkages with industry locally, nationally and internationally. This included work developed with both Queen’s University and Belfast-based Yarra Software Ltd in respect of EPICS software (Electronic Pharmacy Intervention Clinical System). Yarra director Michael Martin also spoke of his positive experiences of working collaboratively with NHS in developing new clinical products. In addition Dr Jill Mairs, Regional Procurement Pharmacist highlighted the benefits of a matrix-based methodology known as STEPSelect, which optimises the procurement and use of pharmaceutical products based on key criteria or clinical effectiveness. Use of the system has also yielded significant efficiencies to the service. Companies supplying these products realised the importance of including HSC clinical expertise in developing new solutions by demonstrating clinical utility at an early stage of their technology development. It is this early engagement with clinicians and a focus on solving problems that often makes the difference between successful adoption and failure. Mr Peter Wilson, Director of Procurement and Logistics Services, Business Services Organisation, gave a presentation on how companies can enter the HSC supply chain. The Q & A session at the end was lively and informative, and the feedback from companies was very positive in both their motivation to get involved and their commitment to work collaboratively with HSC. Professor Scott said that “the session went extremely well with a good attendance from SMEs, and was very valuable in highlighting both the challenges and opportunities in working with the HSC”. As a result of the event, number of potential collaborative projects between the healthcare industry and HSC are now being explored. The Pharmacy and Medicines Management Centre is actively involved in research and development related to all aspects of medicines management and is involved with industrial partners in some of this work. The centre has won national awards for its work and has published widely in peer reviewed journals as well as at conferences worldwide. The centre has links with Sweden, The Netherlands and the South of Ireland in this regard. Contact: Centre for Pharmacy and Medicines Management, 1st Floor, Beech House, Antrim Area Hospital Site, 45 Bush Road, Antrim BT41 2RL; T: +44 (0) 2894 42 4945; F: +44 (0) 2894 42 4243. The Centre for Competitiveness, through its network of around 500 members, supports and facilitates opportunities for sales and growth, building competitiveness and promoting the adoption of innovation. Web: www.cforc.org. HSC Innovations provides an innovation management service for health and social care employees throughout Northern Ireland, ensuring that ideas that have the potential to improve patient care or offer benefits to healthcare providers are developed. Web: www.hscinnovations.org.